Corporate and Cocktails HR Events is the vibrant and fun human resources (HR) networking group. We run regular FREE HR events for HR professionals in London (and soon to be Hertfordshire). We had an amazing talk at our last event from Joolz Lewis from Enlightened Business on 'The Leadership Paradox'. This was our amazing Summer event where we had a fantastic turnout. A number of delegates have asked for copies get in contact if you would like a copy ! "You Can't Sit With Us" - HR Networking Can Be Hard Right? WRONG! No Mean Girls (or boys) here. 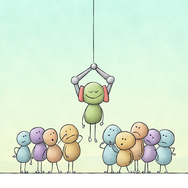 Do you sometimes feel like this when you join a new networking group or attend an HR event? There is a reason the word “work” is in “network". It's because networking can actually be quite hard for some people and a little bit scary at first! So we kept this in mind when we set up Corporate & Cocktails. With our informal and friendly HR networking events, everyone from large corporate HR types to start-up, SMEs and self-employed HR types can find an informative and fun HR group in London, that will cater to their needs. So we encourage everyone to come along to our HR events , mix with peers and employers from across the industry to share ideas, skills and connections over drinks and great conversation. For more information, please drop us a line. We are facilitating another ' Business Clothes Drop' in support of 'Dress For Success' at our HR event on 29th June 2016. Our CSR partner Inspire, Motivate & Engage will be at our Free HR event on 29th June 2016. We are jointly on a mission to promote the economic independence of disadvantaged women, by providing professional clothing and career development tools to help women thrive in work and in life. This is done via the charity partner 'Dress for Success'. We had an amazing success with this initiative a few events ago, that we are going full force again at our up and coming event. So we need your help!! Join us by donating your gently used, nearly-new professional attire. The clothes need to be in good condition and could be worn at an interview. Please bring any items on a hanger if possible, as there will be a collections rail as you come in. With your support, we can inspire women to take charge of their lives. Massive thank you to the team at IME for partnering with us and helping us give back to the business community. 98% of the 360 young people who participated in the programme last year reported significantly improved employability skills. 30% actually found full time employment thanks to the help and guidance of their mentor. As well as offering L&D programmes that positively impact society, IME is the only training provider that commits to giving 5% of its annual turnover to charity each year. I hope that by partnering with IME, you will find a programme that truly engages and develops your staff, but also makes an impact on a cause that is important to so many of us. Are you a 'stand out' HR Supplier we have been searching for?? ﻿ Check out who we'd like to see at our events this year! Corporate and Cocktails HR Events is the vibrant and fun human resources (HR) networking group. Wer run regular FREE HR events for HR professionals in London. We have over 3,000 London HR members and growing. We also work with a number of approved HR suppliers who are part of our group and attend our events. We like to make sure we're able to put our members in front of a variety of approved and knowledgeable suppliers who can provide insight into their useful products and services - with a 'no hassle' approach. We're also interested in chatting to any new HR techy companies. If any of these are you, then we would like to have a chat with you about attending our regular events in 2016. Note that supplier spaces at our events are limited, so get in touch now! Taking the 'WORK' out of netWORKing!! As we openly acknowledge there is no coincidence that the word ‘work’ is in networking. For some, it can be challenging and a little bit daunting, which is why we ensure our HR events are ego free, relaxed and fun. People that don’t value these qualities are probably at some other HR networking event. Leave them there I say!! According to our recent Corporate & Cocktails Survey, when asked: ‘How confident are you at networking in general?’ 67% of respondents said they were generally ok, but needed to push themselves, with 9% saying they often feel uncomfortable networking. When it came to people either loving networking or it not bothering them, this accounted for only 24%. This shows that for over 75% of HR people that responded, networking doesn’t come easily. So, if you are one of the HR professionals that struggle a bit with networking, here are some top tips to make you feel more at ease. My overriding message though is just be ‘you’, as most new attendees will be feeling the same as you are, so will only be too grateful for a chat! So… you’re new to our events and arrive at the venue. We know that walking in can often be the hardest part right? The first person you’re likely to see is either me (the host!) or the person on the registration/sign-in desk. We’re both great people to speak to first, as we typically know most of the attendees and can help introduce you to people. If I’m not around, the person on the registration desk can point you in my direction. Come and speak to me and let me introduce you to others. It’s tempting if you don’t know anyone to make a beeline for the bar – well that’s ok! Grab a drink, but then head towards someone and just say ‘Hi I’m …….’ . A great opener is ‘Have you been to an event before’?, then have chat about where you both work and let the conversation flow… i.e. ‘where are you based’? ‘How many people are in your team or company’? Etc etc. Bingo, you’ve just made your first connection. You have your buddy, now go and speak to someone else (or a group), either on your own, or better still with your buddy. Then two can become three and so on and so forth! A great rule of thumb is to arrive early, so you can ease into speaking to a few people first. Then when it gets busier you’ve already made some connections and warmed up! It’s totally fine to join a group and just hang back and listen to what is being said. When you feel there’s a natural opening, speak up and get involved. Before that point, you can still appear engaged whilst listening. Sometimes you may come across a group that may already know each other i.e. work colleagues, and then you quickly realise that they’re not talking HR, but talking about what’s happened socially to them recently or they are catching up on personal stuff. You mustn’t take it personally if you can’t break into the conversation. Try and pick up on something in common i.e. places, situations etc. If they are totally engulfed in personal stuff, just move on and have another go later on in the evening. Don’t feel deflated, it’s nothing that you’ve done and it’s not a sign that you’re not interesting! One key thing to remember is that you’re not going to have a natural connection with everyone. If the conversation is very ‘stop start’ or you find you don’t have that much in common, there’s no harm in politely moving on. One of the key skills in networking is being able to move around the room and to break away politely from someone or a group of people. It’s easy to just keep talking to the same person or stay within the same group right? Yeah, but if you do this, you’re not going to benefit from other peoples insight and knowledge and you’re not putting the event to its best use. The next person you speak to could be your future HR work colleague or they could give you some valuable advice and guidance. You won’t be offending someone if you decide to move on. The key is to not wander off mid conversation. Below are a few example of how to do this. Oh, it’s always a good idea to acknowledge how nice it was talking to them and that you’ll hopefully have another chat later on in the evening. Some ways of moving on……. When it comes to leaving the event, there’s no right or wrong way. Some people often feel uncomfortable when the group is small, as you don’t know whether to give everyone double kisses or just say “see you everyone” with a little wave gesture. Trust me; the only person who is thinking about this is you. If you spoke to someone a lot during the evening you may want to say ‘good night’ personally and then make your exit. No one is judging you and often people have to leave at different times in the evening anyway due to transport, family responsibilities etc. We’re a very informal and relaxed group! Although I’ve given you some tips, this is just to make you feel a bit easier about networking. You’ll find it’s not that hard and things will naturally flow, as we’re all friendly and welcoming. You’ll have an amazing and fun time. In our recent survey, 50% of people who have attended one of our events now socialise outside our events with someone they have met at our events. While 96% either go to all our events or mostly all of them. Plus, 87% have recommended us to their HR colleagues and connections. So we are doing something right! Want to get a feel for our regular FREE informal and informative HR events - Check them out here! Employee engagement is an enduring topic within the business world. When people flourish, so do the organisations they work for. Conversely, demotivated employees can hold businesses back. When people lack motivation, they are unlikely to do their best work, are less productive and are more likely to leave – increasing overall attrition and its associated costs. Thomas Engage provides a structured and comprehensive health check for measuring employee engagement in your organisation. It enables your business to quickly establish levels of morale, provide a feedback channel for your staff and build a plan of action toward higher workplace engagement and performance. The curse of the Job aka Counter Offer seeker….. The “counter offer”, feared by some employers but sought after by some employees. If you are the employee involved in this situation the key thing is to remain a professional during this process to both your current employer, potential new employer and the recruiter (whether internal or external) who has no doubt worked tirelessly to assist you in achieving a new job offer that you had told them when you registered that you had wanted. As a job/counter offer seeker, whether you have pro-actively started your own job search or you have been approached and temped to move by a recruiter, you need to work out if you even want to leave your current employer and more importantly understand all the reasons as to why you want to leave? Being that job/counter offer seeker who is using the recruitment process or even worse using the services of a recruitment professional in order to obtain a pay rise from their current employer is not an advised option. It is far easier and highly recommended that you first speak to your current employer and put your case forward to them as to why you want and feel deserved of a pay rise/ benefits review/opportunity to progress, way before the job seeking process even starts. Why is it not advised I hear you ask? You may feel the job market is a big place, and yes the UK wide employment sector is extensive, but if you are seeking a new job within a fairly local geographical area to where you currently work/live or within a niche sector you need to think before you act. Using the job seeking process as leverage to obtain a pay rise may come back to haunt you at some point in your future career. In business (and life), “it is key to treat everyone and every meeting opportunity with respect and an open mind, the person you are speaking to might not be of direct assistance but will no doubt be connected to someone that you need to know either now or in the future”. Valuable advice indeed, so why do employers fall for the “counter offer” situation when faced with a member of their team resigning (aka being held to ransom in some cases), frankly recruiting a new member of staff versus retaining an existing one is expensive, from both a time and financial point of view. Sadly an employer who has been cornered into offering a pay rise just may well do so to save further expense and time, particularly when replacing niche skills and experience, which could prove difficult if in short supply. Equally some employers may take your “resigning for a pay rise” personally, especially if they feel their offering to you is already competitive, maybe even generous given your input, resulting in no counter offer and a very awkward resignation period on your part. It is worth considering what your current employer will think of you as an individual for doing this to them, will them increasing your salary after being cornered into doing so add more pressure to your day to day working life? Will it damage your credibility and/or integrity? Will you be seen you in a different light? Also to consider is what if you are still unhappy after receiving more money to stay? As a fan of honesty being the best policy and as good practice I will suggest to job seekers that I work with, citing “extra income” as a reason for leaving, that before I will do anything for them they should speak to their current employer. At least by asking the question before they have taken paid time off for interviews, they can feel safe in the knowledge that there is nothing their current employer can do, so now they are mentally and credibly free to start looking for a new job. If you are fortunate to be in receipt of a pay/job review, before seeking a new job, you will have some time to decide if the extra money is making a difference to how you feel about the workplace/your work colleagues/the job you are employed to do/the commute to and from etc? As if it doesn’t then now really is the right time to look to partner with a quality recruitment professional who will find the right employer for you. Several years ago a national survey was carried out by a national plc recruitment business that found of all employees who upon resigning had received and accepted a pay rise to stay, that 70% of them still went on to leave over the following 6 months but under far less amiable conditions. Money may make the world go round but being happy, valued and progressed in your day to day working life is absolutely essential to being a fulfilled working human being. And remember that if you are already well into the job seeking process and in receipt of a brand new job offer from a prospective employer, who feels that they have done everything in their power to secure you, that if you then turn this job offer down and stay where you are, that bridge could well be burnt for the future. Ask yourself will you regret this decision in 6 months’ time as 70% of your fellow counter offer seekers have? Make the right decision at the right time for you and for your employer, else karma may come full circle…. Clearcut Recruitment is an honest, straight forward and independent recruitment agency based in St Albans, Hertfordshire and London. We recruit for permanent, temporary and contract based jobs, specialising within Human Resources (all levels) and office support - PAs, receptionists, sales, marketing, finance, customer services, projects, EAs, secretaries, events, facilities, office managers to name a few. Come along to our free events and meet other HR professionals from all backgrounds, sectors and levels - all in a fun, friendly and informal environment. We have insightful presenters on a whole heap of hot HR topics. A chance to make great connections with inspirational HR professionals over cocktails & nibbles. Don't forget to pencil these dates into your diary. Event registration info is released to the group via our LinkedIn group around 4 weeks before each event. You will receive this via email as a group 'announcement' email. Places are limited, so it's important you register quickly. Likewise if prior to the event you are no longer to attend, you will be able to cancel your place via 'EventBrite' or just let me know at hello@corporateandcocktails.co.uk. This will ensure that anyone waiting on the 'waiting list' will get an opportunity to attend in your place. Hope to see you at all the exciting events in 2016! 'The Workplace of the Future - the only certainty is change' - at our next Event!! Registration for our exciting next Corporate & Cocktails HR event on 23rd February 2016. In the next generation workplace, the health of a business will increasingly be affected by how well companies adopt environments and technologies that will help people to perform at their best. We'll discuss how HR professionals can incorporate these changes to their companies and deliver increased productivity, efficiency and meaningful cost savings. We are very pleased to welcome Anabelle to Corporate & Cocktails. Annabel is HR Director at ADP UK, a global provider of Human Capital Management solutions. She is a seasoned HR professional with experience across all key areas of HR. Annabel started her career in Recruitment Consultancy before moving into HR for a dotcom start-up and then working in the media industry for 13 years. At ADP, Annabel leads the HR function for approximately 800 employees, and is responsible for the development of strategies related to areas such as pay and performance, talent management and corporate social responsibility. Annabel is a Chartered Fellow of the CIPD and holds a degree in psychology from the University of Portsmouth. Come along to our free event and meet other HR professionals from all backgrounds, sectors and levels - all in a fun, friendly and informal environment. A chance to make great connections with inspirational HR professionals over cocktails & nibbles. Watch this space for registration details. Our events fill up fast, so don't delay in signing up once you see the Link. Following the recent out vote, we will be covering a couple of areas at our FREE Employment Law Update event on Wednesday 29th June, around how this could impact on UK employment law over the next few years. We'll be taking a look specifically at holidays, TUPE & redundancy. Plus a review of recent changes and case law updates. So this really is a 360 employment law update that you cannot afford to miss. We've got a great and varied crowd coming from all business sizes, sectors and seniority. So come along, make great connections, chat HR, all in a relaxed and informal setting. Cocktails and nibbles will be served and don't forget to stick around for our amazing prize draw too! Hope you are all well and I’m looking forward to seeing you all at the event next Wednesday! So to recent news, I’ve finally taken the plunge…... A lot of you will know my passion for good recruitment and I’ve finally found a role with a recruitment business where all day long I can live out my love of getting to know and connecting HR people! I now head up the specialist HR Recruitment Division of Clearcut Recruitment for London & Hertfordshire, recruiting across all HR specialisms and sectors. As you all know I’ve been running Corporate & Cocktails now for over 5 years, so I know a lot of HR people and we now have a member base of over 3,000 London and Herts based HR professionals. I’m offering C&C members a special discounted rate of 14% for jobs registered until the end of August 2016. Even if you’re not planning to recruit until September onwards it is worth our having the conversation so that you can benefit from this introductory rate. Without prior negotiation standard Terms of Business will resume from 1st September 2016 (full copy available on request). If you are considering a career move and looking for new opportunities either in London or Herts, please also give me a shout, so we can have a confidential chat. I’ve got over 15 years in-house HR experience, so I’m not a typical recruiter (I am actually an HR specialist!). You all know me with life being too short that I find suits too uncomfortable to go about life as a corporate grouch (which you know I am not), so my aim is to make the recruitment process as personable and fun as possible whilst we search for your ideal career move together. We are HR people at the end of the day so you can talk HR to me and not only will I understand, I’ll genuinely care. If you are looking for your next HR opportunity give me a shout on 07958 471021 or email me at andy@clearcutrecruitment.co.uk and we can have a confidential chat. I look forward to working with you all in either a client or candidate capacity, or both! See you at the event next week!